The explosion of interest in Freemasonry and secret societies in the wake of Dan Brown’s “The Lost Symbol” has spawned another prime time television series. The new History Channel docu-series “Brad Meltzer’s Decoded” which begins Thursday, December 2nd at 9PM CST, features the Craft in the debut episode. 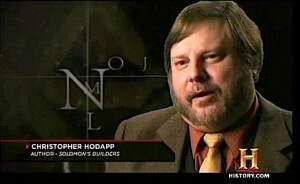 The series, which was developed by Chris Hodapp and his wife Alice Von Kannon, features some of history’s strange connections – some of which involve Freemasonry. Last December, Alice and I were hired to develop a ten episode series for the History Channel. Tentatively titled, “Decoded” (not our choice – it came with the project), the idea was to explore some of the more mysterious monuments, buildings and artifacts in America, from a different point of view. Our concept was to borrow from the structure of the classic James Burke PBS series “Connections” to show how one seemingly insignificant thought or idea or symbol led to another and another, to finally get you to the Statue of Liberty, and so on. 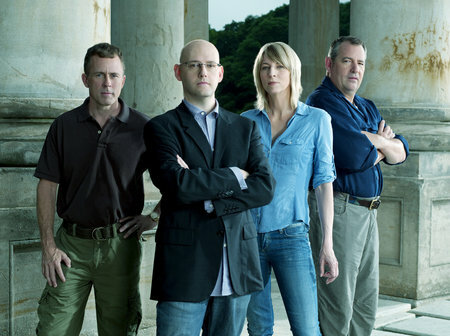 We spent three months providing research, stories and episode outlines, and novelist Brad Meltzer (“Book of Fate”) was hired to headline the show. …was laid down [in 1792] in a Masonic ceremony. Within 24 hours, it mysteriously went missing. For over 200 years, everyone from Harry S. Truman to Barbara Bush has looked for it, but to no avail. Truman literally tore up the White House looking for it. He went as far as gutting the entire interior of the presidential home to search for the long lost relic. “It’s the first piece of the White House and how is that no none knows where it is,” asks Meltzer. What was so special about the first cornerstone? Was it hollow? I so, what was inside, a time capsule or maybe something of even more historical significance? The series premiere attempts to answer those riveting questions. And there’s even an appearance by history’s most notorious secret society, the Masons. According to the Times story, the fraternity is portrayed in a positive light. “What I want to accomplish with ‘Decoded’ is to separate what’s truth and what’s myth. Freemasons are always portrayed as bad guys but they were incredibly helpful, they couldn’t have been easier to work with,” Meltzer said when interviewed. Upcoming issues may feature more Masonic connections, particularly an upcoming episode on the Statue of Liberty, a subject that was featured in Disney’s National Treasure 2: Book of Secrets. WIBW TV-13 News broadcast a feature interview on the Kansas Masonic CHIP program on November 4, 2010. Jeffrey Hunter, Clay Center Lodge Secretary/ CHIP coordinator, Wayne Link, Clay Center Lodge Treasurer and Marvin”Butch” Buchenau of Benevolent Lodge No. 98 were interviewed about an upcoming Clay Center CHIP event and the importance of child identification. The interview highlighted the excellent work of Clay Center Lodge which has held seven events in 2010 completing a total of 148 child ID kits this year alone with hopes for even more participation in the future. In a story filed October 20, 2010, the Lexington Herald Leader reports that the Grand Lodge of Kentucky voted down a by-law proposal at its annual communication to ban membership by openly gay men. The full story is found here. Vulcan Lodge No. 229’s Traveling Gavel has now logged 53,692 miles to 84 Lodges in four countries on three continents in addition to a cruise of the Caribbean. Thirteen Grand Masters have wielded the gavel. This summer the gavel was with Bro. Syd Grotier of Vulcan No. 4382 in Alfreton, England , traveling in the United Kingdom. Bro. Syd, three brethren (Brian Wooley, Michael Hitchcock, & Trevor Harrison), and two wives (Kim Harrison & Teresa Hitchcock), traveled with the gavel and personally returned it to Kansas by way of Bristow, Iowa in September. George Jeffers who crafted the gavel then presented our English brethren with replacement gavels. We then changed the chairs around and watched the brethren from Vulcan #4382 open and close on the 1st degree with a proper accent. 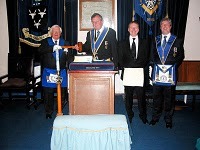 Then the Lodge was opened and after everyone was seated WM Trevor Harrison (No. 4382) presented WM Ken Wheeler (No. 229) with an engraved coal miner’s lantern on behalf of the brethren of No. 4382 (Vulcan No. 4382 is located in a coal mining region and Trevor works in one of the mines). The gavel will not rest long from its arduous travel schedule. Next stop: Cedar Lodge No. 103 in Chanute, Kansas on Wednesday October 13th. 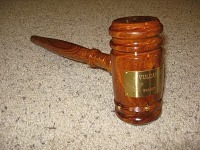 Lodges interested in accepting the gavel should contact Don Wheeler, Secretary, Vulcan Lodge No. 229. There are no fees or costs to accepting the gavel, but we ask that any Kansas Lodge that has possession of the gavel beyond ten days make a $100 donation to the Kansas Masonic Foundation Cancer Research Center. You can view all of the photos from the gavel’s travels here. Pike was requested to expound on his philosophy of Masonry at the meeting of the Grand Lodge of Louisiana in 1858. At that time, several of the lodges and appendant bodies were in conflict with each other over who can best work and best agree. This forty-four page book reproduces his lecture to the assembled Masonic bodies of Louisiana, describing his vision of Masonic fraternity in hopes of mitigating the acrimony. Of singular interest to this reviewer was the timing of this seminal document relative to the publication, thirteen years later, of Pike’s masterwork, Morals and Dogma. There is enough overlap between the morals and philosophy expressed in The Meaning of Masonry that it could be considered an outline or executive summary of the later treatise. 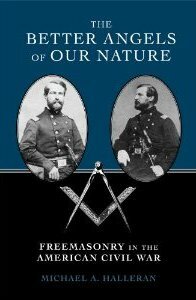 Every grand thought about the valor, honor, compassion, faith, hope, charity, and altruism that should be the mark of every good man and Mason is expressed by this book and elaborated upon by the later ritualistic work of the Scottish Rite. 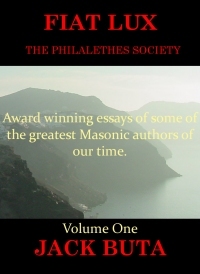 The book was written for the Mason of the mid-nineteenth century, expresses the Masonic enlightenment beliefs of the mid-eighteenth century, yet is eminently descriptive of the desires of the Mason of the twenty-first century. 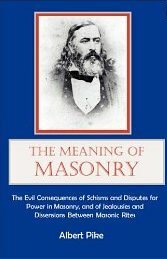 While written for Masons, it should be read by every man who thinks of petitioning the Fraternity, for it clearly and succinctly describes the reality of Masonic thought – stressing virtue, patriotism, liberty, fraternity, and equality in equal measure as the foundation of the Fraternity. This book already had me by two compelling lures before I removed the wrapper. It is focused on the impact Masonry had during the Civil War when our nation of one common heritage and language warred against itself. And, it was written by a Kansas Mason. Brother Halleran is an Emporia attorney. It was a strange period when men could do their best to kill or wound each other and then show their deepest compassion for the fallen foe discovered to be a Brother Mason. Much has been written about this and also anecdotally handed down through family generations. Halleran feels that perhaps too much has been written, some of which is untrue, despite us as Masons wanting to believe it all. He has applied his trial attorney skills attempting to sort facts from myths. Multiple sources of individual incidents were compared seeking resolution of conflicting information. Nearly a quarter of the book is devoted to notes and bibliography to reflect the intensive research done by the author. The reader interested in just good entertainment can conveniently omit this part. The reader wanting intellectual depth will appreciate these details. The author is both a polished writer and a skilled story teller. He does a great job of challenging the face value of dozens of individual stories about the peculiar behavior of Masons during the American Civil War. In one such story he presents an amazingly detailed review of the death of Confederate General Lewis A. Armistead at the very pinnacle of Southern intrusion into the North at Gettysburg. A number of different versions of this story have floated their way forward to our present time. Halleran can help you make up your mind as to what is likely true. I recommend this book to Masons and Civil War history buffs everywhere. Fiat Lux, Volume One is a compilation of award-winning essays published by the Philalethes Society between 1956 and 1986. Covering a wide spectrum of Masonic interest, the essays range from the detailed description of medieval cathedral construction , through the speculative argument that William Shakespeare authored much of our ritual, to the description of modern Masonry in New Zealand. Several of the articles research the time before the formation of the Grand Lodge of England in 1717, when Freemasonry was transitioning from an operative to a speculative character. Of interest to us Kansans may be the treatise of Masonry during the Civil War by Allen E. Roberts, written at the centennial of the start of that war. The article “Masonry Under Two Flags” includes several references to the “bleeding Kansas” period. Several other articles deal with Masonry during the periods immediately prior to and after the war as the nation and the Craft attempted to deal with conflicts between morality and economics. The book is easy to read, and perhaps more importantly, it provides information and insights into parts of Masonic history normally unheard of by the average Mason. I certainly found it worth my cost of membership in the Philalethes Society this year. The International Conference on the History of Freemasonry has announced its third biennial meeting will be held in the United States for the first time. The 2011 meeting of Masonic scholars from around the world will convene at the George Washington Masonic Memorial in Alexandria, Virginia on May 27-29 2011. Since the inception of ICHF more than six years ago it has established itself as the primary conference for academics and others interested in Freemasonry and Masonic research to present research on all aspects of the Craft. Updates on the conference including speakers and event will be posted on the Grand Lodge of Scotland website as it becomes available. The dedication of the Lawrence Masonic Center was well-attended by Lawrence Masons and brethren from around the state. One unusual visitor also made an appearance: the local media with a camera crew. The ceremony was a featured story in the Lawrence Journal World website as well as on Channel 6 News in Lawrence. The story, featured here, contains interviews with Bro. Jon Woodward of Lawrence Scottish Rite and Grand Master L. Kent Needham, accompanied by a video segment of the actual dedication and cornerstone laying, with many Masons in attendance. Underscoring the critical importance of communication – an element of our Strategic Plan — the Grand Master congratulated the decision to invite the press to the ceremony. “Our brethren in Lawrence did a fantastic job of involving the news media in this event; this helps get the word out about what Kansas Masons do and what we’re about.” he said. For assistance in involving the media in your lodge event, contact the Grand Secretary’s office. 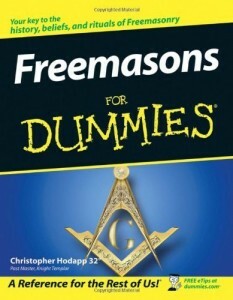 The author of numerous Masonic books and articles including Freemasons For Dummies and Solomon’s Builders: Freemasons, Founding Fathers and the Secrets of Washington D.C., Chris Hodapp will be the keynote speaker at the 2010 Grand Lodge Wardens School at Emporia Lodge No. 12 on Saturday, October 2, 2010.